Just imagine: You finally have your Orange County home or office just the way you like it. You’ve invested thousands into construction and landscaping, renovations and painting. Then the day comes when you need to replace or repair your sewer line. Not only does it not fit into your budget; the problem cannot be ignored. You know that contacting a team to excavate your existing line is unavoidable, and your heart sinks at all the time and money that you will lose to do it. 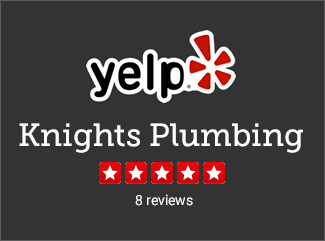 Knight’s Plumbing has good news for you. Most repairs in sewer lines these days can be conducted from inside your existing line, with minimal digging! We are the right company, with the right tools and experience, and can get this job done with minimal expense and hassle. We offer free estimates and flat rate pricing. We won’t just re-open the sewer line, we will make sure it stays open, for good! Like many buildings in Orange County, if your home or office was built some time ago, your sewer line may already be obsolete. Certain materials, like iron or clay, are destined to deteriorate from corrosion, or form cracks from shifting earth, water pressure, or root systems. Roots are a particular nuisance, because they keep coming back, like a ghost. You can trim them with a rooter, but they continue to enter your pipe, thirsty for water. 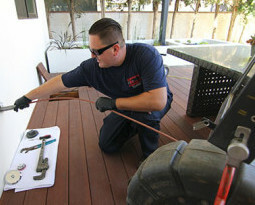 Does your Orange County property have sewer line damage? You know your sewer line is damaged when your drains make a gurgling sound, emit an offensive smell, or continue to back up, even though the plumber you call keeps unclogging it. Avoiding repairs is out of the question: Sewage not only has an unpleasant, overpowering smell, you have a serious health hazard. Sewage carries life-threatening pathogens, both viral and bacterial. Putting off repairs only makes the problem worse, as the smell gets stronger and stronger, and the backups happen more and more frequently. In addition, sewage leaks contaminate groundwater and are terrible for the environment. If the leak occurs inside your building, then you will also have a spill that needs to be cleaned up in order to avoid bacteria and mold infestation. Mold is another critical issue; once a building has black mold, it faces a major cleaning. But if the mold gets into too many places, it faces a major cleaning, which must be done by a professional restoration company. This is not a job for a local handyman. You need a trusted name with years of experience. You need the clog to be cleared and the back-ups to stop. But you also need a thorough inspection of your sewer line to make sure that it never happens again. And you need a comprehensive repair solution that gives you several viable options, each at its own flat rate. When you call Knight’s, they will give you a free consultation over the phone. They will listen to you carefully, and give you several theories as to what’s causing the problem – and give you an accurate quote in person. With every drain cleaning, we provide a free video inspection, using the very latest in video camera technology. You will see the problem with your own eyes, and understand exactly why we are quoting you the price for the service we recommend. The nature of the service depends on the problem. Sometimes digging is unavoidable. If your sewer pipe is collapsed or fragmented, or if the roots breaching it are too large, you will need our team to unearth the line and replace it. In doing so, we will install the most modern of piping material, to prevent further problems. Also, we can free the line from problems around it. Once we bury it, you can be confident that you won’t have another issue for a long time. However, for small cracks, pinholes, and roots, we strongly recommend relining your pipe. After a thorough hydro-jet cleaning of your pipe, we install a sewer sleeve inside the pipe to line it. Afterward, air pressure is used to force the resin into every crack and hole in your pipe. 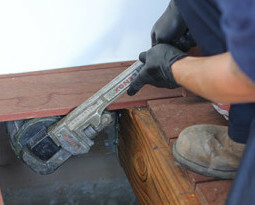 Once the resin has lined the pipe completely, our professionals allow it to harden. From this point on, no roots will be getting in. Once lined, your pipe is as good as new. Our liners are designed to last over 50 years, and Knights Plumbing backs up the work with a 50 year guarantee on all sewer pipe lining. Once the repair is complete, we will completely clean and disinfect the work site. We will make sure that you are completely confident that your home or office is sanitary, and ready for everyday use. When finished, the building will be restored to its original look and function. As you examine the site, you will see no trace of a problem. Because “Trenchless Technology” can be accomplished with minimal any digging, you can enjoy a solution to your sewer problem without having to pay exorbitant construction costs. The only thing you need to make sure of is that you choose the right service provider. The wrong team can damage your sewer line even further, fail to notice critical issues, or apply the resin incorrectly, or before the line has been adequately cleaned. In such case, you will avoid problems for a while – but years later, you may experience an epic problem, without even knowing it came as a result of poor craftsmanship. Knight’s Plumbing is available and ready to help solve any plumbing emergency 24 hours a day, 7 days a week. We know that a plumbing emergency is stressful enough, and our flat rate pricing ensures that you will not get any extra surprises when it comes to emergency repairs. We are proud to serve Orange County and have satisfied customers in Fullerton, Santa Ana, Westminster and all over the Anaheim areas. No matter where you are located in the Orange County area, Knight’s Plumbing will be there to solve your plumbing emergency. If you are in need of emergency plumbing services, please call us anytime 24 hours a day, 7 days a week at (714) 476-5290. We will solve your emergency and have you back in order in no time! 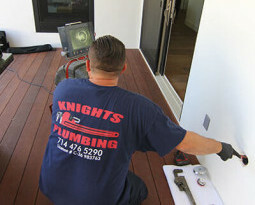 Knights Plumbers are located all over Orange County. We offer Flat Rate Pricing – No Surprises – Our Emergency Plumbers will solve your plumbing issues quickly and professionally.